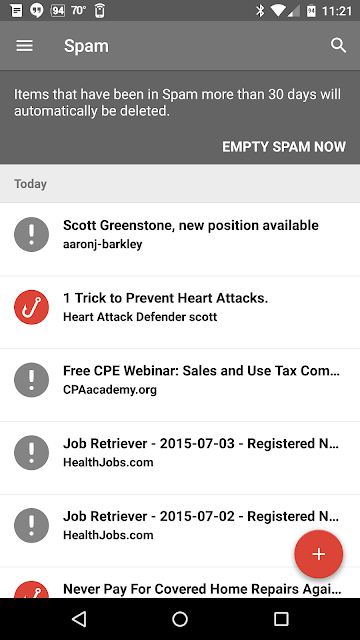 Update 9/9/15: The Empty Spam feature has been rolled out to iOs users. All users should have this functionality now. Update 8/3/15: The Empty Spam feature has begun rolling out to web users. The process to empty spam is the same as listed below for Android. As mentioned earlier, Google really are listening to the requests of their users. As such, the Inbox team began rolling out the ability to empty your Spam folder on Android devices in a very similar way they provided the ability to Empty Trash. When you go into your Spam folder in the Android App you will be presented with a message informing you that the items in Spam will be automatically deleted after 30 days. In addition you will have the option to EMPTY SPAM NOW. Those that can't wait the 30 days can clear out their Spam folders. Please note this has not started rolling out for Web or iOs yet, only Android.